ScribbleLive hosted a chat on the shortage of women in the essential STEM (science, technology, engineering and mathematics) career fields. We were joined by Cecily Carver, Co-Director of Dames Making Games; Tendu Yogurtcu, VP Engineering at Syncsort; Jen Lamere, a 17-year-old who won the TVnext Hackathon; Laura Plant, Director at Ladies Learning Code; and Mélanie Attia, Director of Digital Marketing at Silanis Technology. Our experts discussed how to get more women to enter into the tech field, the obstacles they face, what it's like to work in the field, what can be done to lower barrier to entry and much more.If you'd like to see more chats like this in the future, please take a moment to fill out the questions below. I recently read about schools adding art studies into traditional STEM curricula. I think this would help attract more girls and women to STEM, as well as connect science and tech with creative and innovative thinking. My father encouraged me to pursue all things science and computing. 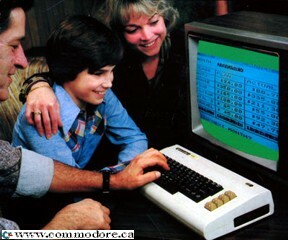 When I was 6, he bought a Commodore Vic 20 it was my first forray into coding. I remember doing a very basic line of code that did an infinite loop, which was printing my name on the screen and getting colors to flash across the tv screen. I was hooked. Fast forward later, and I thought myself how to code html and java script. I don't code anymore but it gives me the ability to understand the challenges businesses face when having to adopt new emerging technologies to remain competitive. he also encouraged me by getting me books on biology, a telescope to look at the night sky and a microscope to understand the unseen world. And he wasn't a scientist, he was a sales man! He just understood the importance of curiosity. couraged me to be a problem solver. When I was in university, some of the women on the faculty started a group for women in CS where we could just get together and talk about how we felt about the program. It made a world of difference to me feeling like I had some company! It inspired me to keep going through the tough times. 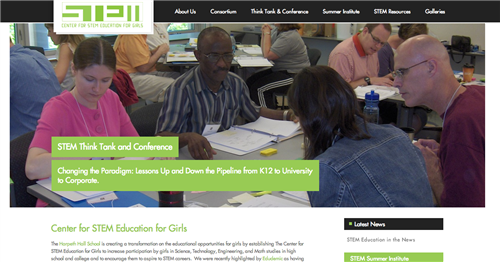 The Center for STEM Education for girls says its mission is to assist in the effort to ensure "American schools and universities ... remain competitive in the STEM fields." Good point. Empowering teachers with technology in the classroom will help spark the imagination for all present. Ha! Melanie...I had a Vic 20 too. My mom was a systems analyst, and bought me one when I was 5. Thought I took more to the social side of things vs programming, she played a big role in making sure I never feared technology. Bring your kids to work is another way to inspire more girls into technology and science, imagine at Silicon Valley - how this can work. I didn't become inspired until a few years into my career, when I realized how technology is critical to me being successful and effective! My lack of tech savviness was holding me back and I saw so many young people entering my network that were empowered to do such creative things with tech. My one concern with bringing in kids to the office, is they should choose a career in computing because its something they're passionate about, not because they are interested in the perks that come with it. What do you see that schools are doing well to combat this and what still needs to change? What would you say to a school age girl pondering a future STEM path? I see a lot of women get inspired by building things other people can use, rather than the machinery or the programming itself. And I think that's fine. Steven Institute of Technology (@FollowStevens) is one of the top schools for #WIT, very strong #mentorship program - #STEM. They invite high school students to live technology demos on campus – works very well. Stevens students also teach in local area school, which creates role models for those students, topics like Robotics, Phyton, mobile development, etc. Girls Learning Code runs 'We'll Take Your Kids to Work' where we take 30 girls into 5 tech companies. It's a pretty epic and eye-opening day for these girls. We see the 'whoa' moments when the realize how exciting the industry is. Some of them have no idea! In order to ensure they aren't just inspired by 'perks' the girls participate in hands-on, relevant activities in each office, that allow them to experience some of the realities. It's only a start though.. I don't know how far anyone will get in pursuing a tech career, without enjoying the work. Thoughts? 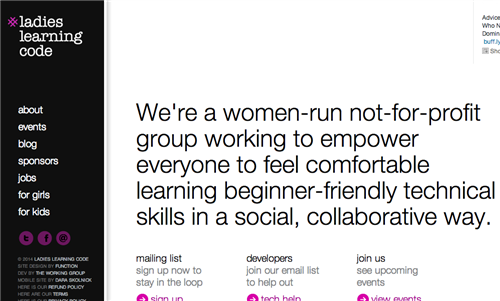 For more on Ladies Learning Code and their laudable mission, click here. My advice to a school age girl would be to find the fun parts, and just jump into building things. I would especially emphasize not worrying about "geek cred" -- that's one of the major things that make people feel like they don't belong, or that they shouldn't be there. Good point Melanie. So many women come to Ladies Learning Code to skill up for their existing jobs, not because they are planning a career move necessarily. There is a great movement here in Montreal called the KidsCodeJeunesse.org which aspires to get every child in Canada the opportunity to code. Elementary education is the great equalizer and will push today's girls to explore the industry with the most promise and the least women - the IT business. 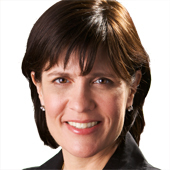 there are quite a few female leaders at the tech giants nowdays...Ginni Rometti – IBM, Marissa Mayer, CEO yahoo, Sheryl Sandberg – facebook, Meg Whitman – HP, Ursula Burns – Xerox ...but most of them tend to come up through the sales and marketing channel...(Marissa is the exception there...maybe one or two others above)..vs the hard science.....maybe this high profile visibility will get more girls interested in the space in general. Yes, Laura! I am seeing a lot of impact with programs that aim to teach programming skills to librarians, writers, scientists in other fields, etc. RE the term GEEK >> I asked a group of girls what a geek is the other day. They said, it's someone who is really into something. Like, a foodie. It's becoming a cool thing to be. This new gen (19 and under) is really more about being unique and different and quirky than gens of the past. I am so impressed with the TPL and Librarians interest in becoming tech-savvy! It's awesome to see. Thanks for the recommendation Tendu! For those of you who want to learn more about Steven Institute of Technology , you can check out their website. AllThingsDSandberg, Mayer, Gates and more rate. For any school girl or boy: do what you are passionate about and study technology to support that! Steve this is a good point. 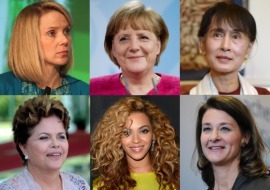 More female role models in tech will definitely help.It's so important. Colleges and universities like Rutgers, Rockefeller University, Iowa State University, Boise State and more now feature dedicated women in STEM programs. When I run game development workshops, I like to talk as well about how programming isn't the only skill that matters when it comes to working in technology. It helps the participants feel like they're bringing something to the table, and it's true. Another essential tool which I feel is direly lacking in early education: courses on critical thinking and asking questions. That gives girls the tools to challenge the status quo, empowers them in front of bullies and enable them to challenge stereotypes. Post college, what are the biggest challenges facing women who want to either teach or work in STEM fields? Have those challenges gotten better or worse in the past few years? I think the biggest challenge is not trying at all and fear of failure. I think a lot of the biggest challenges are internal. If you're one of only a few women, it's easy to feel like you don't belong, and that there's going to be a spotlight on your mistakes. Work-life balance is big too. In some companies there's a chest-beating culture of heated/aggressive arguments, all-nighters, ruthless competitiveness, etc.